Today's race was certainly a special one for me and all my team mates. 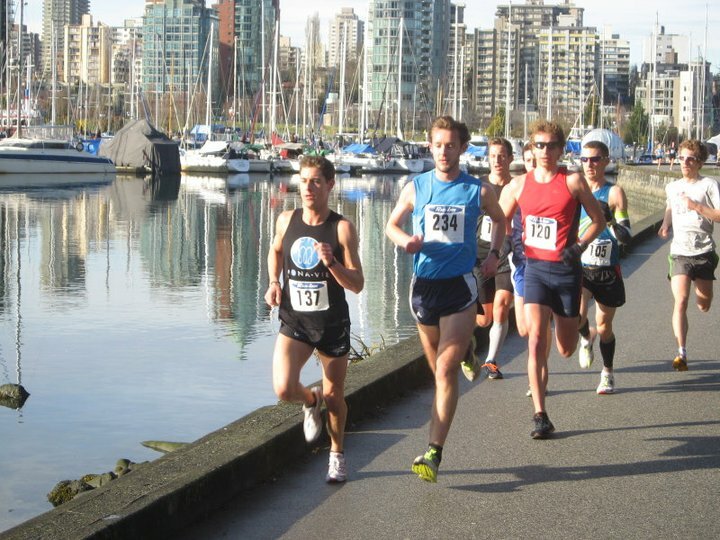 As you all must know, I am part of one of the best (or in my opinion it is the best) running clubs in the Lower Mainland, The Vancouver Falcons Athletic Club or more commonly known as VFAC. In order to stay alive and support the many elite athletes and superior coaching, we rely on two races that we as a team volunteer and organize. 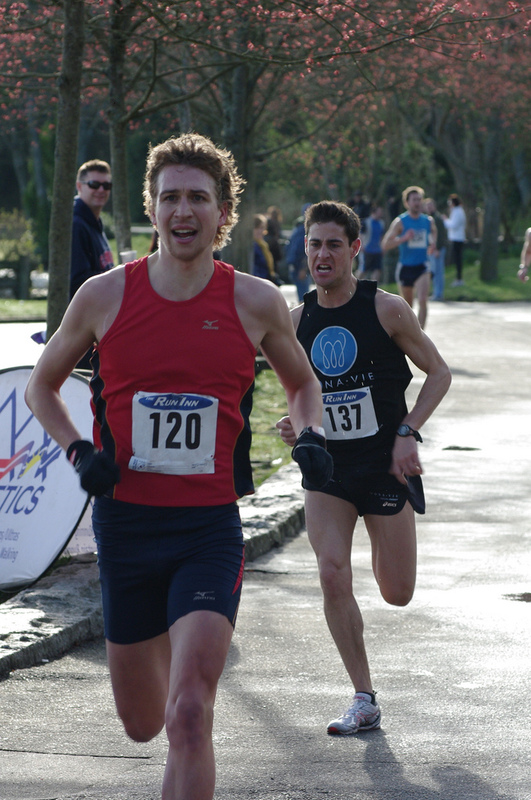 In the past few years, the first of the two races, The Dave Reed Memorial 5k (a race named after a team member who passed away who was the epitome of the sport) was selected to become the BC 5k Championships. For the last couple of years I volunteered to do as much as I could to help out with our club races. It takes a lot of people and organization to make these events a success. To be a part of our running club, it is mandatory that you volunteer or get someone to volunteer in place of yourself if you have hopes of racing. 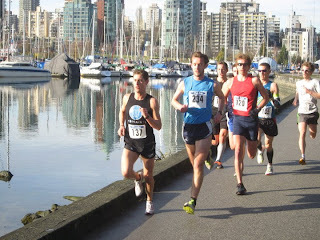 Regularly I would not have run this race, but this time I really needed the points for the BC Timex Road Race Series. After his performance at the First half, Drew Nicholson was ahead of me for points and I knew he had plans of racing this one. He is one of my main competitors when it comes to racing in the series so I had to defend my spot. I really want to make it onto the BC team this year and every race I hope for better results. The faster I get, the more points I score. There were some mixed feelings about my late decision to enter this race as a competitor and not a volunteer but I was able to bring two volunteers in place of myself. I felt a bit of shame for leaving my team to put it on by themselves, but I figure I do a lot of work as the club's secretary and over did it as a volunteer at last year's races. That was my guilt free attempt to race this one. We have a great group of people and they ended up managing extremely well to put on a flawless event. The temperature was mild with no wind and no clouds just like the weather at last weekend's Harry's Spring Run Off 8k where I set my second PB in two weeks of 25:49. It was feeling like a perfect day to go 3 for 3 in the means of setting personal bests. At the starting line I only noticed a few contenders on the provincial scene which may give me a run for the money including last year's winner Matt Clout. I think his name is so fitting of this sport as he dominates the shorter distances and therefore has a lot of clout when it comes to competing. Haha sorry, I know I'm a cheese ball but couldn't resist that one lol. Perhaps it's the second coffee I've drank to keep me focused on writing three in a row. Back to the task at hand. There was the usual hyping up of all the front liners as we cheered and got ready to rock. Some were quiet and focused, but for me and a few of my running friends at the front it was all about slapping hands and wishing good luck to one another. I have finally lost all the nerves involved with being in the start of the big races. It was a major obstacle I had to overcome. I love being relaxed at the front and rubbing shoulders with guys who have been smoking me for years and now are within my reach. I feel important up front and finally a sense of belonging comes over me as the gun goes off. I watch as all the young guns tear ahead, and I now know my threshold when climbing the first hill as how not to go too fast out of the start. The first section starts with some ups and downs and there is nudging and shuffling for position. I have to make sure to get in with the right crowd because it won't be long before the young guns lose steam and by the second and third kilometre we are filing into our finishing positions(almost). There are some early pushes from some young triathletes who's efforts are futile against the strong pack of at least six runners by now which I have set the pace and was trading back and forth for the lead. I had to cut one runner off as I always take the shortest line through the corners and around the course and am now very dominant with my running style. I won't let many get in my way and if that means kicking heels and cutting off, that's what has to be done. I am not rude, however and did apologize and if I do ever kick heels, it usually means you have dropped the pace. Sorry about that! I was feeling very comfortable and consistent with my effort going into the lighthouse at Brockton Point. As we blasted through and flew out onto the other side, there was a small descent of a couple meters and we were in the last kilometre of the race. There were two contenders left with me, one who had pushed a bit early and I was sure with this other guy we would be able to catch him. The guy I was with pushed by in front of me. They were both tall and it seemed as though their legs carried them more efficiently than my short ones. I had the heart to make up for their strength and length and pushed to be right on the heels of this triathlete. We were closing the gap on the runner who pushed ahead and as we matched him, he blew up and damn near stopped. That was nice, but the battle was still on for me and Simon Witfield's protege. He was strong and had obviously been doing his speed work as there were many surges within surges happening in the last 300 meters. I put every last ounce of fuel on the fire which was now blazing inside my legs and lungs but to no prevail. I was unable to close the one second gap between myself and this gutsy competitor before we crossed the line. I knew it was a battle for second place overall which was huge for me at this calibre of a race. In the end, I still ended up on the podium. I saw the clock and was ecstatic to have made such an improvement over my most recent 5k PB 2 weeks ago at the St. Patty's Day 5k going from 15:49 to 15:39. Luckily this guy wasn't a member of BC Athletics so to the victor (me) go the spoils of being rewarded the silver medal and $100 at the BC 5k Championships!! That makes it three PBs in three weeks of races. Next up is the Fool's Run AKA the BC Half Marathon Championships where I hope to make it 4 for 4. Stay tuned runners!! Things I hate: Feeling like there are no more gears to shift in to. Things I love: Watching the seconds fly off my personal bests.